Dairy Day at the New York State Fair celebrates some of the benefits the industry brings to the economy. It also brought out some of the problems facing the industry. WAER News Director Chris Bolt went to Dairy Day and spoke with farmers and workers' rights activists. Fairgoers were lined up to get milk at the dairy bar, view the butter sculpture, maybe have an ice cream sundae or yogurt...and check out champion cows. Dairy Day is a time to honor the biggest chunk of our agriculture economy. Bill Maricle of Ash Mar farms is enjoying the yogurt boon. "It's promising if we can keep the interest up from the people, I'm hoping it's just not a fad." "I mean if we could get the prices up of our milk it would make it a whole lot better for everybody. Paying higher prices for everything, but getting the same prices for the milk that we got 25, 30 years ago." A group outside the fair was looking for more respect for dairy farm workers, often immigrant labor. Workers Center of Central New York organizer Rebecca Fuentes, though a translator, shared the conditions relayed by one upstate laborer. Workers rights and union groups protested the plight of some undocumented workers on dairy farms. "In our jobs there are many unsafe conditions. we're assigned jobs where we have to handle chemicals but are not give the appropriate equipment or training. We have to work with dangerous machinery that's in bad condition." Fuentes says that's coupled with poor living conditions and 12-hour days for an estimated 2600 undocumented workers. Union officials joining the protest say access to fair labor laws...and organizing...could help. Dairy pumps almost $9 billion dollars into the state economy...the workers say they harvest that bounty...but don't get much of it. 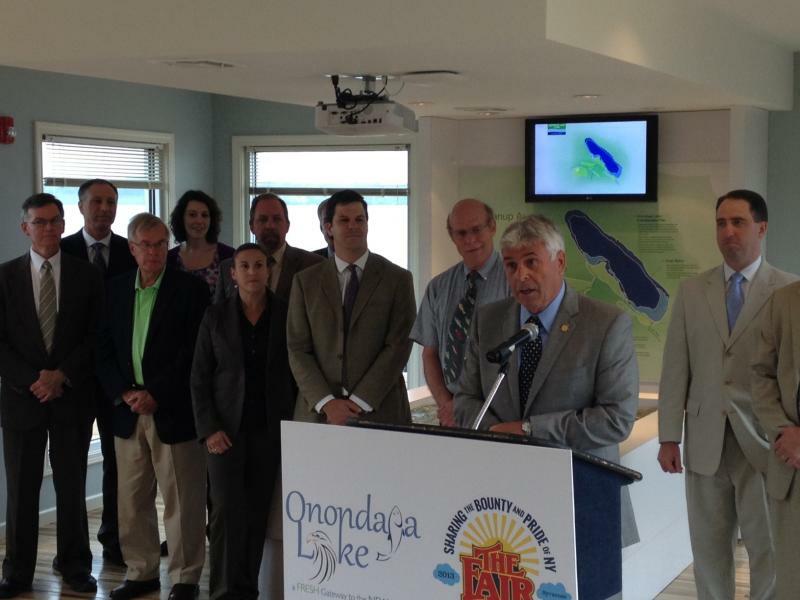 The story of Onondaga Lake including all of its blemishes will be on display for visitors to this year’s New York State Fair. A new three-thousand square foot exhibit in the Center of Progress building will chronicle the lake’s past as the ancestral grounds of the Onondaga people to its ongoing recovery from decades of industrial and municipal pollution. SUNY E-S-F President Neil Murphy says the space will allow visitors an interactive, hands-on experience. 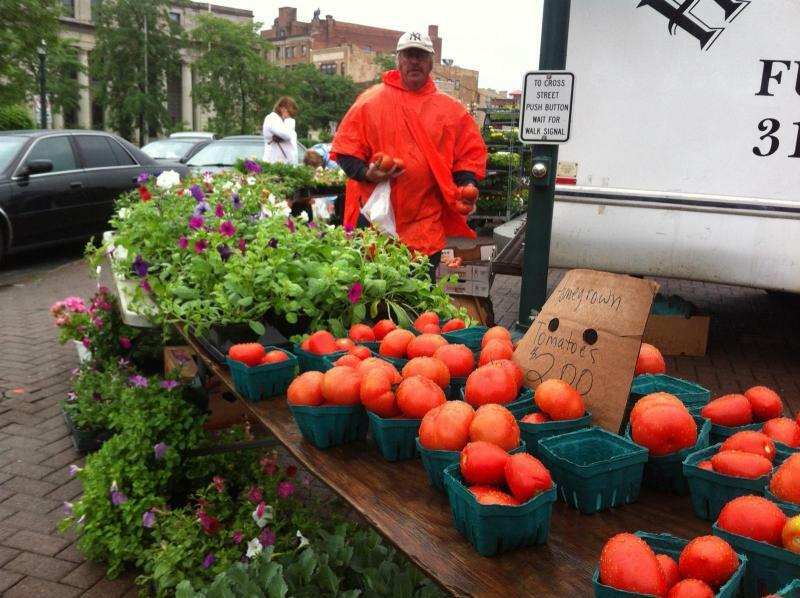 A rainy start to the Downtown Syracuse Farmers’ Market today didn’t keep it from opening with a splash. Workers stopped by on their lunch breaks to enjoy the fresh produce and baked goods, and left with items to take home. The weekly event featured dozens of vendors selling fruits, vegetables, wine, baked goods, dairy products and decorative plants.